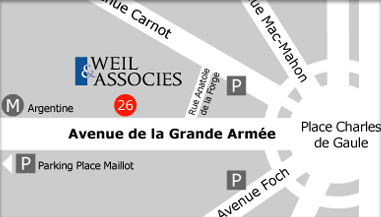 Our offices are at 26, Avenue de la Grande Armée very close to the Arc de Triomphe. We are in the center of the Paris business area. 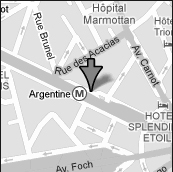 Public underground car park facilities are available at Avenue Carnot and Porte Maillot. The Argentine metro station (line 1) is near by our offices. The suburban express train RER stops at Charles de Gaulle - Etoile which is at 5 minutes walking distance. - There are many hotels available close to our offices and we can assist you in making a reservation.